A good writer will always help you out. Whether you’re feeling blue, or ebullient, or confused -- or simply want something articulated -- there is always someone, somewhere who has said it just the way you would like it to be said. And then you can feel slightly relieved. 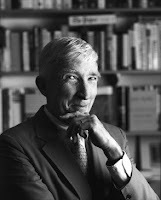 And so it was when I read John Updike’s non-fiction. 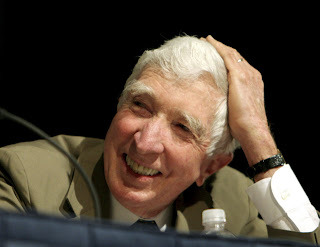 Whether it was in The New York Review of Books, or in The New Yorker, I knew that when I read an essay about even the most obscure (to me) painter, writer, sculptor or poet, Updike would be able to sum up the artist for me in relatively short order, and in such a way that would either make me seek out the subject’s art, or avoid it. This may strike someone as snobbism on Updike’s part, or gullibility on my side, but we all need a guide. But, still, the essays themselves were always clear and beautifully turned. He was an education for me all in his own right. His fiction just wasn’t my thing -- but that isn’t a put-down. It was a shining light for many people, over a long period of time, and there are only a very few writers with his output, stamina, and public acceptance. I was a little shocked when I read he had died. He always struck me as one of the lean, patrician New England types who effortlessly lives to be 93 -- even though New England was his adopted home. But even so. Like so many other people, I had drawn a clear line of succession from J.D. Salinger, John Cheever and John Updike -- this may not be as clear cut as it seems, but it always seemed a noble lineage. Now Salinger, in his resilient quietness, is the only one left. So I was wondering what I could say about Updike and his world, and his art, and I remembered something that John Cheever had said in the introduction to his own short story collection, which won the Pulitzer Prize in 1978. “These stories seem at times to be stories of a long-lost world when the city of New York was filled with river light, when you heard Benny Goodman quartets in the corner stationery store, and when almost everybody wore a hat,” Cheever wrote. Ah, yes. A good writer will always, always help you out.